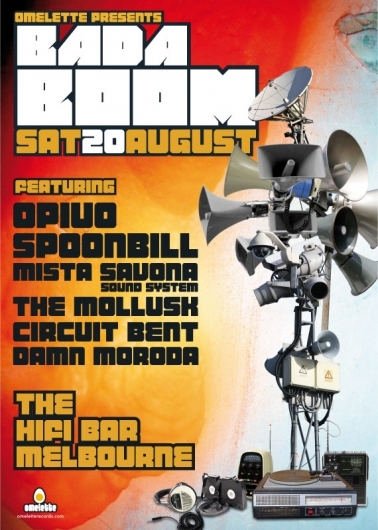 BADA BOOM ~ Sat 20th Aug @ HIFI BAR Melbourne. Sat 20th August 2011 @ The HiFi Bar Melbourne. Omelette is ecstatic to present an epic night of cutting-edge groove laden electronica from the cream of Melbourne’s pioneering beat smiths.Saturday 20th August is set to be one of the standout nights to remember on this years beats calendar with a foundation shaking line-up of home-grown headliners plus live theatrical performances, interactive and immersive installation art and eye popping visuals. This event celebrates the launch of Opiuo’s hotly anticipated new EP; The Squiggle EP that continues to cement the man as a ‘chief of beats’ on the international party circuit. Also launching on the night is Circuit Bent’s richly glitched funked-up debut release on Omelette Records; Trench Foot, that is sure to turn heads and keep them spinning. This event will also welcome Spoonbill back to Occaland’s shores after recently demolishing the Canadian summer festival circuit. Expect a body-shaking serve of chunky wonkadelia. Also featuring on the night are the irresistible grooves of the Mista Savona Sound system, the wild and brilliant sonic morphings of The Mollusk, plus the fresh, funk-fuelled grooves of beats outfit; Damn Moroda. This event will no doubt rock the block all night with solid stomp-core grooves, immersive visuals, live performances and interactive installations... lets have some serious fun! The HiFi Bar, 125 Swantson St Melbourne.